Forward control referred to positioning of the steering mechanism forward of the front axle and engendered the "Corvair FC" moniker for the line. The short, 95 inch wheelbase yielded vans resembling (in size) more recent minivans. With a gross vehicle weight rating of 4,700 pounds the pickup trunks were intended for lighter though possibly bulky loads and not to compete directly with conventional half-ton pickups. Local fleet delivery service was in mind, but as history has shown, the market for the LDFC was smaller than expected -- the day of the compact pickup had not yet arrived. Nevertheless, forward control engineering plus short wheelbase afforded great maneuverability, a turning radius of only 19.5 feet, and a clear view of the road ahead. The engine was of the same design as in Corvair cars: a rear-mounted, horizontally-opposed six cylinder, air-cooled engine that delivered 80-HP and 128 ft-lbs of torque with 145 in3 of displacement. However, recognizing the Corvair 95's cargo hauling purposes, the "turbo-six" engine was enhanced with better exhaust valves and valve rotators, a lowered compression and larger jets for a richer fuel mixture from the carburetors . The power plant was upgraded to 164 in3 and 110-HP in 1964. Some enthusiasts have replaced the stock engine with a Corvair Monza 140-HP, four-carburetor powerhouse for a smother drive up hills and with large cargo loads. The compartment for the powertrain necessitated an elevated floor bed in the rear of the vehicle, an inconvenience for those wanting a full-sized flatbed pickup, but marketable also as loading areas at two levels. The vehicles had semi-unitized body construction (both welded and bolted together), yielding a mid-section floor that was remarkably sturdy and positioned only 14 inches from the ground. In the vans, the lowered mid section allowed easy access for passengers and loading of cargo, with intermediate doors on both left and right sides in some models. And, in one of the most innovative design elements of the Corvair 95 line, the Rampside pickup was given a side fold-down access panel. With its engine located in the rear, the Corvair 95 cab was well isolated from engine heat and noise with enough room for a full length bench seat. 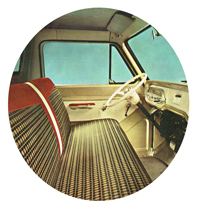 Delux models included upholstered door panels, and such luxuries as a passenger-side visor! In some ways, the Corvair car and Corvair-95 were a transition from the more flamboyant, ornately outfitted vehicles of the 1950's to the more austere stream-lined styling that we know today. Aerodynamics certainly were not a design high priority, but were improved by the contouring of the body above the front sculpted cove and the slope of the windshield. Overall, the Corvair 95 was remarkably well-proportioned; accentuated by the double concave cove along the sides and traditional two-tone painting scheme, these FCs display a distinctive elegance. *Production figures as revised by Dave Newell, Corsa Communique, May 2017, pages 8-11. BRAKES: Hydraulic, front & rear 11" x 2"; lining area 167 sq. in. DIRECTIONAL SIGNALS: Front & rear. ENGINE : Turbo-Air Six; 80 hp; 145-cu-in displacement. FUEL TANK: capacity 18 1/2 gallon. SPRINGS, FRONT: capacity 1,150 lb. each. SPRINGS, REAR: capacity 1,150 lb. each. SUSPENSION, FRONT: Independent, capacity 2,500 lb. SUSPENSION, REAR: Independent, capacity 2,500 lb. WINDSHIEL WIPER: dual electric; single-speed. BUMPERS, Chromed, Front & rear. CUSTOM EQUIPMENT: Interior and exterior appearance, comfort and convenience features. DOORS, BODY: Left side for Corvan model. FLOOR, LEVEL PICKUP BOX: Pickups only. PAINT, TWO-TONED EXTERIOR: Choice of 14 combinations. SEAT: Full-width front for Corvan model. TIRES: 7.00-14/4PR white wall; 7.00-14/6PR blackwall or whitewall. TRANSMISSIONS: 4-speed synchro-mesh (includes 3.27 rear axle ratio); Powerglide. WINDSHIELD: 2-speed electric (includes washers).